Military Tax Refunds | Atkins & Co.
Are you in the Armed Forces or have you left within the last 4 years? Do you drive your own vehicle to the bases you’re posted to, or use public transport? You could be owed an average tax refund of £750 per year and can be claimed back 4 years. That could be £3000 owed back to you. Postings to bases outside the UK are included too. Don’t let HMRC hold on to money that’s rightfully yours, contact Atkins & Co Chartered Accountants and expert Military tax advisors to find out how much of a refund you can get. For those in the Military, sorting your tax refund couldn’t be easier. Making a claim is simple, download and complete the forms to the right, or give us a call on 01934 527888 and one of our friendly team of advisors will be happy to help. Who can get a tax refund? All current Military personnel (and those left within the last 4 years) with drafts intended to be for 24 months or less can apply whether you are in the Army, Navy, Marines or RAF. Our friendly, expert team can quickly assess if you have a claim. If you do, we’ll deal with the admin so you can sit back and plan how to spend the money. Why choose Atkins and Co? We have close personal links to RN and RM and as a result really do strive to do the best for you guys. Many of our existing clients would vouch for this. We have deliberately kept our fees at low fixed cost of only £100 per year to ensure you guys get to keep the vast majority of your refund rather than pay a large percentage of it back to us in fees. If you have no claim, then there is no charge. We have a huge amount of experience in completing these claims back as far as 2002 so you can be sure we know all the ins and outs of the law, have dealt with thousands of these refunds to date and will only make legitimate claims. We have already successfully reclaimed millions and pride ourselves in the friendly yet professional service given. We are qualified chartered accountants with in excess of 30 years experience, therefore not only are we fully regulated we are also able to competently deal with any other aspects of your tax affairs too. If you’re in the Armed Forces, have drafts for 24 months or less, use your own vehicle or public transport to travel to base, and have been posted to different bases (including outside the UK), you may be due a tax refund. We assess your claim for free and will only charge if you have a claim. If there is no claim there is no charge! We claim tax relief on the costs you incur in travelling between your “main residence” and “temporary workplaces”. Your main residence is your home. A temporary workplace is a posting of 24 months or less. We apply the rules set out in sections 336 – 339 of the Income Tax (Earnings and Pensions) Act 2003 to see whether you can claim. If your circumstances meet the criteria, you’re entitled to claim tax relief on the cost of your travel at the approved HMRC mileage rates. We will email you a very simple form to complete showing the dates and addresses of your postings. If we need any more details we will call you to confirm. We will then submit to HMRC, handle any questions on your behalf and chase them if there is any delay in your refund – it’s all part of our service. Your tax refund is sent to us and we then deduct our small fee and send the balance straight over to you. On average, our clients get £750 per year, and we can reclaim your expenses for the last four complete tax years. 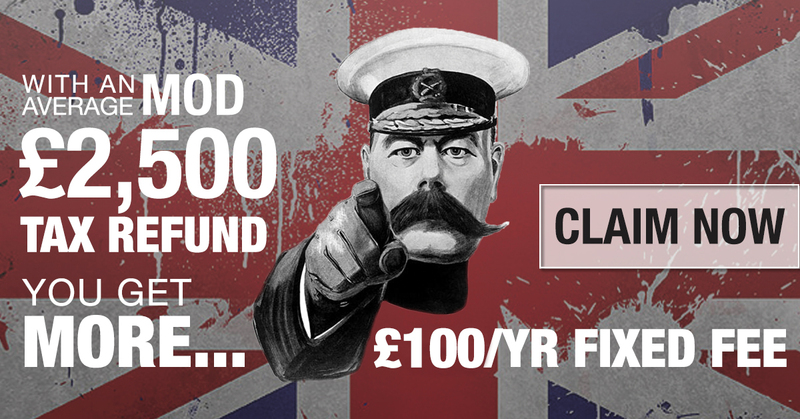 So your first claim could be worth around £3000 which after our fees would be around £2600 in your pocket. How much will it cost me and when do I pay? We charge a very low fixed fee of £100 (including vat) per successful year claimed, which we deduct from you refund once it has been received, paying the balance directly into your bank account. Once we’ve got all your information, it usually takes about 4-6 weeks to put your claim together. We send your claim to HMRC who will take another 6 – 8 weeks on average to pay out. The most important things we need from you are a list of bases you’ve attended, including any time spent on courses, deployments or tours of duty, your monthly payslips and your move and track. You can get copy payslips and your move and track from JPA. We also need you to sign a couple of forms for HMRC that allow us to speak to them on your behalf, and get you set up to make the claim. The download claim pack on the right will list out everything we need and information on how to obtain it. The claim pack & both tax forms (SA-1 & 68-4) must be obtained by calling the office on 01934 527888, printed and completed. I receive GYH/ HDT – Can I still claim? Yes. Anyone can make a claim – it is irrelevant whether you receive GYH/HDT or not, although amounts already received are factored into the calculation. Probably, but we will take care of this a part of the service. Yes, if you’ve claimed too much. We assess your claim thoroughly against the legislation and providing you give us full and accurate information, the claim will be legitimate so no money will be repayable. Yes, as long as you are travelling. If you live on base during the week but go home to another address for weekends or longer periods of leave, then your home address would be classed as your main residence. The claim in this case would be for travel between your home address and your workplace. If you already receive a Get You Home Travel (GYH) allowance for this this would be taken into account in the calculations. Yes. HMRC can always ask to see a copy of your assignment order to back up any claim. Where a copy has not been retained you could be asked to obtain a copy. If you do not have, or cannot obtain, a copy of your Assignment Order, there is a risk that HMRC will reject your claim. The Assignment Orders will be used to support the expectation of the length of your draft and hence whether a base is temporary or permanent in the eyes of HMRC. I’m based Overseas, can I claim? Yes, you can claim for travel to and from a UK residence. However, if your family are Overseas with you, your accommodation there would normally be classed as your main residence. Do I need receipts for flights / ferries? Yes, as the cost would vary so we will need proof. I live with my partner / parents, can I claim? Yes, if this is your main residence.